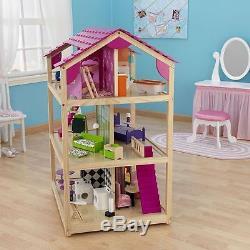 Large Open Play Rolling Pink Wood 12 Doll Dollhouse w 50Pc Furniture Accessories. Three levels and ten rooms. 50 colorful pieces of furniture. Made of composite wood materials, solid wood, fabric and plastic. Accommodates all fashion dolls up to 12 inches tall. Packaged with detailed, step-by-step assembly instructions. 34.25 inches long x 27.25 inches wide x 46.25 inches high. 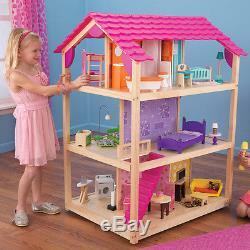 An imaginative three-level, ten-room interactive dollhouse, this minimalism-inspired toy has a four-sided open design and staircase. It comes with fifty colorful pieces of matching miniature furniture to allow budding interior designers to decorate according to their tastes. For practicality in small spaces, this unique dollhouse rolls on casters for easy mobility and its sturdy construction will stand up to the wear and tear of playtime. 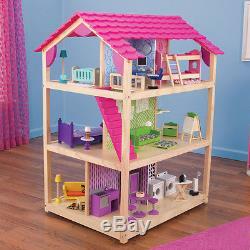 Plus, the interactive dollhouse can easily become a Barbie dollhouse because it's designed to accommodate standard Barbie dolls or figurine up to 12 tall. OTHER ITEMS Thanks for looking. Since computer monitors vary in color -- the actual color of the item may differ from what's shown on your computer screen. We are a clearinghouse of major retailers. Special note for INTERNATIONAL buyers. Please take special caution that all electronics electrical items CDs and DVDs are formatted based on the United States Standards and may need an additional adapter to work in the countries outside of the USA. 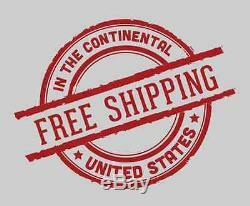 Please be sure to check that these items are compatible for use outside the USA. The item "Large Open Play Rolling Pink Wood 12 Doll Dollhouse w 50P Furniture Accessories" is in sale since Friday, November 06, 2015. This item is in the category "Dolls & Bears\Dollhouse Miniatures\Doll Houses". The seller is "upandup_410*" and is located in US, United States. This item can be shipped to United States, Canada, United Kingdom, Denmark, Romania, Slovakia, Bulgaria, Czech republic, Finland, Hungary, Latvia, Lithuania, Malta, Estonia, Australia, Greece, Portugal, Cyprus, Slovenia, Japan, China, Sweden, South Korea, Indonesia, Taiwan, South africa, Thailand, Belgium, France, Hong Kong, Ireland, Netherlands, Poland, Spain, Italy, Germany, Austria, Russian federation, Israel, Mexico, New Zealand, Philippines, Singapore, Switzerland, Norway, Saudi arabia, Ukraine, United arab emirates, Qatar, Kuwait, Bahrain, Croatia, Malaysia, Brazil, Chile, Colombia, Costa rica, Panama, Trinidad and tobago, Guatemala, Honduras, Jamaica.